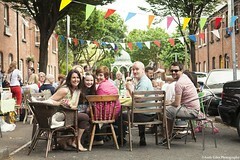 Street Feast is a day of local lunches across Ireland hosted by you and your neighbours. They can be anywhere really — out on the street, in a local park or in your front garden. You can run one of these, or just make up your own. A car park party or a field party could be even better. To celebrate our streets, cul-de-sacs, neighbourhoods & local communities. To support and shine a light on the communities, networks and organisations that are holding everything together. To encourage more life on the streets, feel safer and reduce loneliness and isolation.